"I fell in love with the shape and decided to keep it as it was in its modified form. 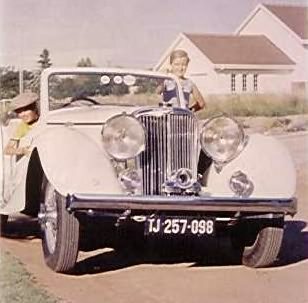 The car is a 1936 model, with a metal and wood body, and the X frame chassis. 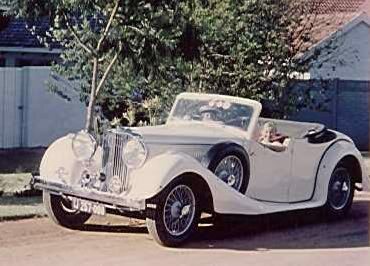 The chassis number is 10500 , which if my understanding is correct makes it the 500th SS Jaguar, which is rather nice. The original engine number is not known and it has a Johannesburg Municipality allocated number. (If anyone you can find out what the original number should have been, it would be interesting ). The engine has the early single piece exhaust manifold and two piece water uptake manifold with vertically mounted thermostat. However the carbs are from a later model (with the thermo starting device), as is the water pump and the engine stabiliser bracket which has a single hole mounting for the rubber vibration damper. Steel conrods have also been fitted. "In 1978 the engine developed a sudden knock. We got it home, stripped it and found that two of the small end bushes had disintegrated and that the others were on their last legs. Although the pistons and conrods were not damaged, some of the metal bits had got into the main bearings and caused some damage. After 6 months of scouring we found a set of 10 thou oversize bearings and rebuilt the motor with the right valve timing (!) and it sounded great. "At this point unfortunately 'disaster' struck. We noticed a series of fine cracks developing all over the paintwork and on closer examination discovered that a very thick layer of spray-on body putty had been used (up to 3mm thick in some places) which was separating from the base metal. Furthermore some rust spots were appearing through the chrome in some places. We partly dismantled the car and found that some of the wood frame would also need attention. 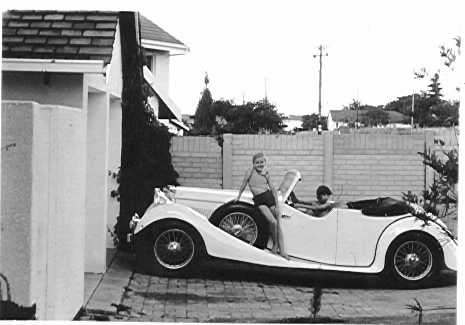 We then moved to a new property in Halfway house where I did not have appropriate facilities, or time, to do any further work on the car, and it was placed on blocks pending the availability of time, finance and facilities to do something about it. 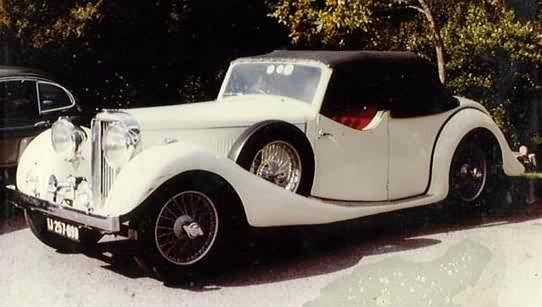 In the intervening years, I scrounged around for various parts such as the original instruments which I eventually located in the UK (actually a 1937 set which is the same except for the rev counter which is reversed - I have the proper drive gear and a reconditioned temp gauge sensor)." Carvel has now entrusted further work on the car to a local restorer.